Home > History Section > Waffen-SS Divisions > 5. SS-Panzer-Division "Wiking"
Naming History Des. 1940: SS-Division "Germania"
Fate Surrendered to the British and Soviets in May 1945. The division was not ready for combat until 29 June 1941, seven days after the launch of the operation. During its first action, near Tarnopol in Galicia, Ukraine, the division acquitted itself well. In August, Wiking was ordered to establish a defensive perimeter around a bridgehead across the Dniepr river. Despite determined enemy attacks, the division held the line. 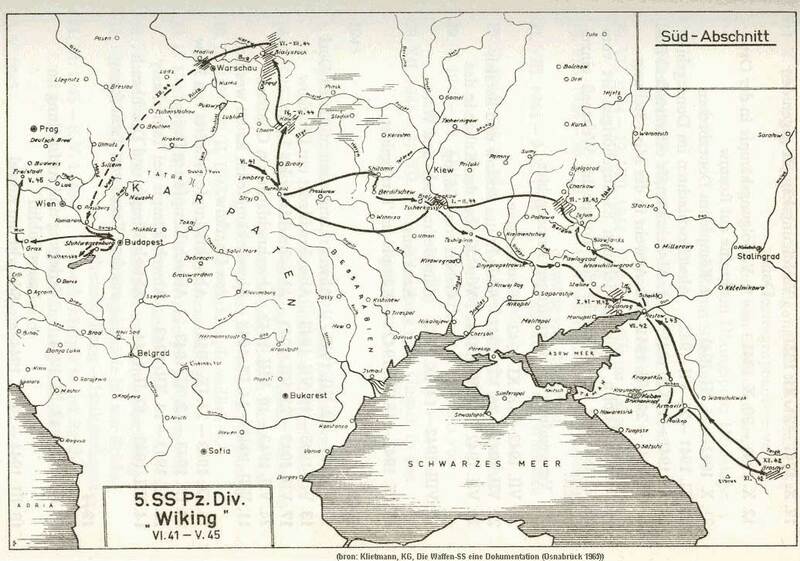 Against stiffening resistance, the division continued its advance towards Rostov-on-Don. It took part in the heavy fighting for Rostov before being ordered back to the Mius River line in November. During 1941, the Heer officers in charge of the deployment of the Wiking were skeptical of its fighting abilities and so were hesitant to commit it to major actions. As the division proved itself again and again in combat, it began to earn the grudging respect of the Heer commanders. After successfully holding the line over the winter of 1941-42, Wiking was ordered to retake Rostov-on-Don and advance into the Caucasus, securing the region's vital oilfields. This attack was known as Operation Maus, and formed a part of Army Group South's offensive Case Blue, aimed at capturing Stalingrad and the Baku oilfields. Launched at the height of summer, the offensive was unexpectedly successful. Within six weeks, Rostov and the entire Don region had been recaptured, and Wiking was driving deep into the Caucasus. By late September 1942, Wiking was in a position to launch an assault to capture the vital city of Grozny. Working in cooperation with General der Panzertruppen Traugott Herr's 13.Panzer-Division, a plan was arranged to capture the city. As they reached the Terek River, the Soviet defences solidified. Several obstacle belts had to be breached before the Georgian Road (along which American supplies were transported) could be reached. Realising the difficult situation, Steiner divided his division into four columns, each with separate objectives, but all aimed at breaching the Soviet defences and opening a road to the Caspian Sea. The Nordland regiment was to attack along the Kurp River to Malgobek. The Panzer battalion (Abteilung) Wiking, with elements of the Germania regiment, was to breach the main line of defence and establish a bridgehead. The Westland regiment was to capture the town of Sagopshin, and the division's engineer component, along with the rest of Germania was to advance along the Kurp. The attack got underway on the night of 25-26 September 1942. Nordland's assault soon bogged down, as they realised that not only were they outnumbered by the enemy , but the enemy was also well entrenched in prepared positions. Within thirty minutes, almost half of the men of Nordland had fallen. Despite this, Nordland still captured the hill, and its commander Fritz von Scholz was awarded the Knight's Cross for his actions during the battle. The division finally captured Malgobek on 6 October, however the objective of seizing the capital and opening a road to the Caspian was unreachable. The closest point to Grozny, Hill 701, was captured by the Finnish volunteers (III (finn.) /SS-Infanterie-Regiment (mot) Nordland.) During this operation, Wiking had lost over 1,500 men. Several combat units were reduced to only dozens of men, and as a Wiking veteran later wrote, "Casualties weren't counted anymore, just men left alive." In the first week of November 1942, the division was transferred from the Terek bend to the Urukh-Alagir sector to participate in the renewed attack eastwards, which was attempted in the direction of Ordzhonikidze rather than via Grozny. It ended up arriving just in time to extricate 13th Panzer Division from encirclement at Gisel, after which it took up defensive positions behind the Fiagdon river. The encirclement of Friederich Paulus's 6.Armee at Stalingrad meant that the Caucasus was relegated to a secondary theatre, and when the attempt to relieve Stalingrad failed in the face of further Soviet advances, the entire Caucasian position itself began to come under threat. Wiking was one of the first formations to be withdrawn to bolster the retreating 4th Panzer Army, entraining from 24 December for transport to Remontnaya, arriving there on 31 December. The division fell back through Zimovniki, Proletarskaya (holding open the bridge over the Manych), Zelina and Yegorlykskaya towards Bataisk and Rostov, finally escaping through the Rostov gap on 4 February. The notorious 'Angel of Death', Dr. Josef Mengele, served with the Wiking during its early campaigns. According to all accounts, he performed the normal duties of a combat medic, even being awarded the Iron Cross for saving two wounded men from a tank. After being wounded, Mengele was deemed unfit for combat and was absorbed into the SS KZ system, where he gained his infamy. Mengele was very proud of his Waffen-SS service and his front-line decorations. As the true horrors of the KZ system came to light, his former comrades attempted to have his name removed from the division's roll of veterans. 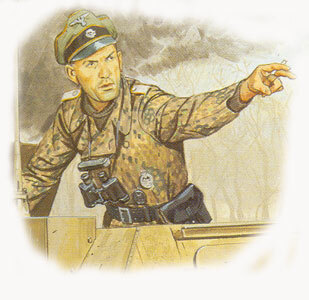 In late November 1942 the division was redesignated 5.SS-Panzergrenadier-Division Wiking. By now, the division had gained a reputation as an elite formation. In early 1943, the division was ordered to fall back to the Ukraine south of Kharkov, recently abandoned by Paul Hausser's II.SS-Panzerkorps, and now the scene of fierce fighting for its recapture. Erich von Manstein, the new commander of Army Group South, threw Wiking and the 11.Panzer-Division into action against the Soviet Mobile Group Popov, now threatening to break through to the vital rail line. Wiking had great difficulty dealing with the armour-heavy Soviet formation. The Panzergrenadier regiments of the Wiking were exhausted and understrength from the fighting in the Caucasus, and the Panzerabteilung lacked sufficient armour to counter the Soviet force. 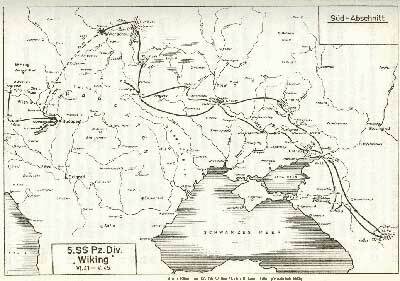 Despite this, the division held off the Soviet assault, protecting the vital rail line and helping bring about the destruction of Mobile Group Popov. After the recapture of Kharkov, Wiking was pulled out of combat to be refitted as a Panzergrenadier division. During mid-1943, the Wiking underwent a major transformation. Steiner, now an SS-Gruppenführer, was transferred to command of the III. (gemanische) SS-Panzerkorps, currently forming in Croatia. His replacement was Herbert Otto Gille, who was to prove himself Steiner's equal. The remnants of the veteran Nordland regiment, along with its commander Fritz von Scholz, was removed from the division and used as the nucleus of the new 11.SS-Freiwilligen-Panzergrenadier Division Nordland. Also, the Finnisches Freiwilligen-Battalion der Waffen-SS was disbanded, as the agreed two years' service of the Finnish volunteers had expired. With the upgrade to Panzergrenadier status, the division received SdKfz 251 halftracks for the infantry and an increased Panzer strength. Thanks to Himmler's and Hausser's efforts, it had been decided that all Waffen-SS Panzergrenadier divisions were to have a regiment of Panzers, rather than only an abteilung (battalion). This meant that the SS-Panzergrenadier formations were full-sized Panzer divisions in all but name. In an attempt to offset the loss of the Finns and the Nordland regiment, the newly formed Estonian volunteer formation Estnisches SS-Freiwilligen-Panzergrenadier-Bataillon Narwa was attached to the division. While the division was refitting, it was involved in minor skirmishes with partisans. The reorganisation was completed by late June, and the division was moved to Izyum where it, along with the 23.Panzer-Division was to form the reserve force for Manstein's Army Group during the approaching Operation Citadel. While the operation was in effect, several Soviet formations attacked towards Orel and Kharkov simultaneously. The Wiking was engaged against the forces near Kharkov, with the Estonians acquitting themselves well, destroying around 100 Soviet tanks over several days. When Citadel was cancelled, the division was still involved in halting Soviet attacks. Further to the south, on the Mius-Front, a major Soviet offensive, Operation Rumyantsev, threatened to break the German lines. Wiking was joined by the 3.SS-Panzergrenadier-Division Totenkopf and 2.SS-Panzergrenadier-Division Das Reich and sent to the Mius-Bogodukhov sector to halt the Soviet attacks. In subsequent fighting, the SS divisions defeated two Soviet tank armies (totalling over 1,000 tanks) and destroyed over 800 tanks. At no time did the SS divisions have any more than 50 panzers in working order. In October, the division was again pulled back out of the line, this time to be restructured as a panzer division, the 5.SS-Panzer-Division Wiking. To bolster the strength of the division, the Walloon volunteer unit SS-Sturmbrigade Wallonien was attached to the division, and the fresh-faced Walloons with their Rexist leader, Leon Degrelle, were the subject of ridicule from many Wiking veterans until they proved their worth in the fighting for a forest near Teklino, at the head of a salient into the Soviet lines. A second panzer abteilung was also ordered to begin formation in Germany. While Wiking was engaged near Teklino, several Soviet tank formations had advanced along the side of the salient and succeeded in encircling the German forces of XLII and XI Army Corps near Korsun. During the battle of the Korsun-Cherkassy Pocket, Wiking defended against Soviet attacks on the eastern side of the pocket. While General der Artillerie Wilhelm Stemmerman, the overall commander for the trapped forces, moved his forces to the west of the pocket in readiness for a breakout attempt, Wiking, along with the Wallonien were ordered to act as a rearguard. After repulsing all Soviet attempts to break through near the town of Novaya-Buda, the Wiking rearguard split up and began withdrawing one platoon at a time, under cover of darkness. Advancing through Hell's Gate, the Wikingers came under heavy enemy fire with little or no cover. The division suffered heavy losses and lost almost all of its equipment during the carnage of the Korsun Pocket. Divisional commander, Gille, had proven his loyalty to his men, fighting alongside them and remaining in action until all survivors had escaped. He was one of the last to cross the raging Gniloy Tikich river to safety. After the end of this battle, the Wallonien brigade was withdrawn from the division. After a brief period of rest and refit, the tattered Wiking was sent to assist in the defence of Kovel, currently threatened by strong Soviet forces. Gille led his men towards the town and began setting up a defensive perimeter. However, soon the soviets had completed the encirclement of the city. The II./5.SS-Panzer-Regiment Wiking, newly equipped with Panther tanks, along with the III./SS-Panzergrenadier-Regiment Germania, newly equipped and up to strength arrived at the front from Germany and immediately began forming a relief unit. The unit was formed under the command of SS-Obersturmführer Karl Nicolussi-Leck, commander of 8.Kompanie/II.Abt./5.SS-Panzer-Regiment Wiking. Nicolussi-Leck immediately launched an attack with five Panthers. Soon after beginning the attack, he received a radio message from the besieged commander to halt his attack and withdraw. Nicolussi-Leck ordered his radio operator to ignore the call, and continued his attack. Risking court-martial, Nicolussi-Leck then proceeded to fight his way though the Soviet encirclement, destroying several Soviet tanks in the process. His Panther was the first vehicle to break the encirclement, and for his actions he received the Knight's Cross. After the relief force established a corridor to the encircled force, the withdrawal began. Unlike the previous encirclement at Korsun, the trapped force managed to escape with most of its equipment intact, and the division was ready for action immediately. In late August 1944, the division was ordered back to Modlin on the Vistula River line near Warsaw where it was to join the newly formed Army Group Vistula. Fighting alongside the Luftwaffe's Fallschirm-Panzer Division 1 Hermann Göring, the division annihilated the Red Army's 3rd Tank Corps. The advent of the Warsaw Uprising brought the Soviet offensive to a halt, and relative peace fell on the frontline as in Warsaw Höherer SS- und Polizeiführer Erich von dem Bach Zelewski destroyed Warsaw with its civilians and partisans. The division remained in the Modlin area for the rest of the year, grouped with the Totenkopf as IV.SS-Panzerkorps. Gille was promoted to command of the new SS Panzerkorps, and after a brief period with SS-Oberführer Dr. Eduard Deisenhofer in command, SS-Standartenführer Rudolf Mühlenkamp, commander of the Wiking's panzer regiment, took command. Heavy defensive battles around Modlin followed for the rest of the year, and in October, Mühlenkamp was replaced by SS-Oberführer Karl Ullrich. Ullrich would lead the division for the rest of the war. Panzerknackers of the 5.SS-Panzer-Division Wiking, Modlin, 1944.In late December 1944, the Axis forces, including IX.SS-Gebirgskorps, defending Budapest were encircled and the IV.SS-Panzerkorps was ordered south to join Hermann Balck's 6.Armee (Army Group Balck), which was mustering for a relief effort. The efforts were to be codenamed Operation Konrad. As a part of Operation Konrad I, the Wiking was committed to action on 1 January 1945, fighting alongside the Totenkopf. Near Táta, the advance columns of Wiking slammed into the Soviet Fourth Guards Tank Army. A heavy battle ensued, with the Wiking and Totenkopf panzers destroying many Soviet tanks. In three days Wiking and Totenkopf's panzer spearheads had driven 45 kilometers over rugged terrain, over half the distance from the jump-off point to Budapest. The Soviets maneuvered forces to block Gille's advance, and they barely managed to halt the advance at Bicske, only 28 kilometers from Budapest. Gille pulled the Wiking out of the line and moved it to the south of Esztergom, near the Danube bend. The second relief attempt, to be known as Operation Konrad II, got underway on 7 January. In atrocious conditions, the Wiking advanced southwards towards Budapest. By 12 January, the Westland Regiment had reached Pilszentkereszt, barely 20 kilometers from Buda. That morning the Wiking panzergrenadiers spotted the church spires and turrets of the distinctive Budapest skyline poking through the morning fog. Despite its success, the Wiking, overextended and vulnerable, was unable to exploit its breakthrough and was eventually ordered to pull back and regroup. Hitler was furious at the lack of progress, and called the operation 'utterly pointless'. A third attempt, Operation Konrad III, launched in cooperation with the veteran III.Panzerkorps took place 100 kilometers to the south. This attack resulted in a 15 mile gap being torn in the Soviet lines and the destruction of the 135th Rifle Corps. Only the quick redeployment of more troops by the Russians prevented a German breakthrough. By the end of January the Wiking and Totenkopf had suffered almost 8,000 casualties, including over 200 officers. At the beginning of February, the besieged forces capitulated, and the Wiking was ordered west to Lake Balaton where SS-Obergruppenführer Sepp Dietrich's 6.SS-Panzerarmee was preparing for another offensive. After the failure of Konrad III, the Wiking began defensive operations, falling back into Czechoslovakia. West of Budapest in more defensive operations, moving into the area of Czechoslovakia. Gille's corps was too depleted to take part in Operation Frühlingserwachen near Lake Balaton, and instead remained as a support to SS-Obergruppenführer 'Sepp' Dietrich's 6.SS-Panzerarmee during the beginning of the Operation. Wiking performed a holding operation on the left flank of the offensive, in the area between Velenczesee-Stuhlweissenberg. As Frühlingserwachen progressed, the division was heavily engaged preventing Soviet efforts to outflank the advancing German forces. As the offensive stalled, the Soviets launched a major offensive, the Vienna Operation, on 15 March. Attacking the border between the Totenkopf, stationed to the north of Wiking, and the 2. (Hungarian)Panzer Division, contact was soon lost between these formations. Acting quickly, Balck recommended moving the I.SS-Panzerkorps north to plug the gap and prevent the encirclement of the IV.SS-Panzerkorps. Despite this quick thinking, a Führer Order authorising this move was slow in coming, and when the divisions finally began moving, it was too late. On 22 March, the Soviet encirclement of the Totenkopf and Wiking was almost complete. Desperate, Balck threw the veteran 9.SS-Panzer-Division Hohenstaufen into the area to hold open the small corridor. In the battle to hold open the Berhida Corridor, the Hohenstaufen bled itself white, but Gille's corps managed to escape. On 24 March, another Soviet attack threw the exhausted IV.SS-Panzerkorps back towards Vienna, all contact was lost with the neighboring I.SS-Panzerkorps and any semblance of an organised line of defence was gone. The Wiking executed a fighting withdrawal into Czechoslovakia. By Early May, they were within reach of the American forces, to whom the division officially surrendered near Fürstenfeld, Austria on 9 May.